The passenger cell remained stable in the frontal impact. The car has driver and passenger knee airbags as standard equipment and dummy readings indicated good protection of the knees and femurs of both front seat occupants. The car scored maximum points in the side barrier test. The car also scored maximum points in the more severe side pole impact with good protection of all body areas. The protection provided by the seat and head restraint against whiplash injuries in a rear-end collision was marginal. The electrical safety of the car was checked after all of the impact tests and no problems were found. Forward movement of the head of the 3 year dummy, sat in a forward facing seat, was not excessive and both dummies were properly contained by their restraints in the side impact test. The passenger airbag can be disabled to allow a rearward facing child restraint to be used in that seating position. However, information provided to the driver regarding the status of the airbag is not sufficiently clear. The dangers of placing a rearward facing restraint in the passenger seat without first disabling the airbag are clearly explained in a permanently attached label. The bumper offered good protection to pedestrians' legs and the bonnet was mostly good in those areas likely to be struck by the head of a child. However, no points were scored by the front edge of the bonnet and the bonnet surface offered almost entirely poor protection to the head of a struck adult. The Volt has electronic stability control as standard equipment and is fitted with a seatbelt reminder for the driver, front passenger and rear seats. The Chevrolet Volt has been scrutinised by Euro NCAP and the car is structurally identical to the Opel Ampera and has the same interior fittings. 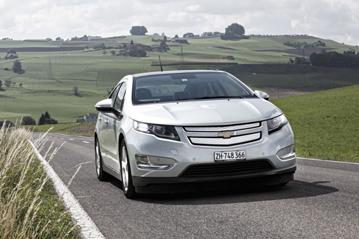 Chevrolet has informed Euro NCAP that the Volt also has the same levels of safety equipment as the Ampera. Accordingly, Euro NCAP believes that the star rating of the Ampera can also be applied to the Chevrolet Volt.